Spanish cuisine embodies everything we love about food: beauty, flavor, imagination, fresh ingredients and community. That's why we are teaming up with Mi Paella to bring you Paella on the patio. Join us for a night of Spanish wines and cocktails, tapas, live paella cooking and flamenco guitar. Seating is limited for this intimate evening, so secure your spot today. Reserve your seat for $20, which will be applied to the total ticket price of $55. 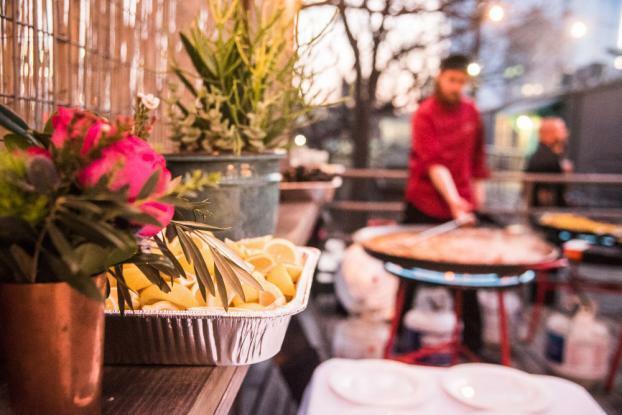 Mi Paella Specialty Paella Catering is the vision of Chef Saul Arteta and Sommelier Sisi Berry to join their passions of food and wine into a beautiful, perfectly paired feast. What they do, will make your event stand out by creating an artistic and colorful experience that transcends just "food". MI Paella focuses on providing the highest quality ingredients and using fresh organic products to create a Spanish menu that transports you to the Mediterranean. Chef Saul creates menu's seasonally to ensure proper freshness of all dishes. They pride themselves in the authenticity of the Spanish Cuisine that they represent. With a specialty in Paella, Valencia native Chef Saul brings his home flavors on giant "paelleras" right to you. Along with an assortment of both classic and re-inspired Tapas, making certain that every event will not only be delicious, but memorable. Spanish cuisine embodies everything we love about food: beauty, flavor, imagination, fresh ingredients and community. That why we are teaming up with Mi Paella to bring you Paella on the patio! Join us for a night of Spanish wines, tapas, live paella cooking and flamenco guitar. Reserve you spot for $20, which will be applied to the total ticket price of $55.